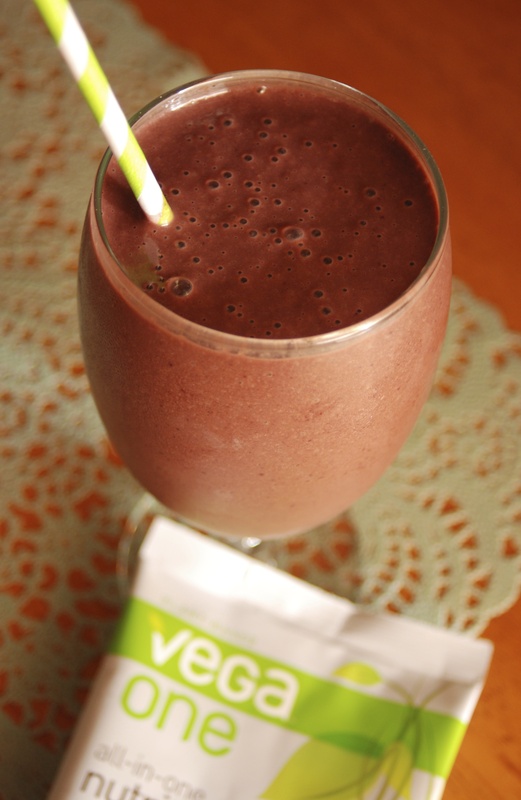 Did you get a chance to blend up something delicious yet? 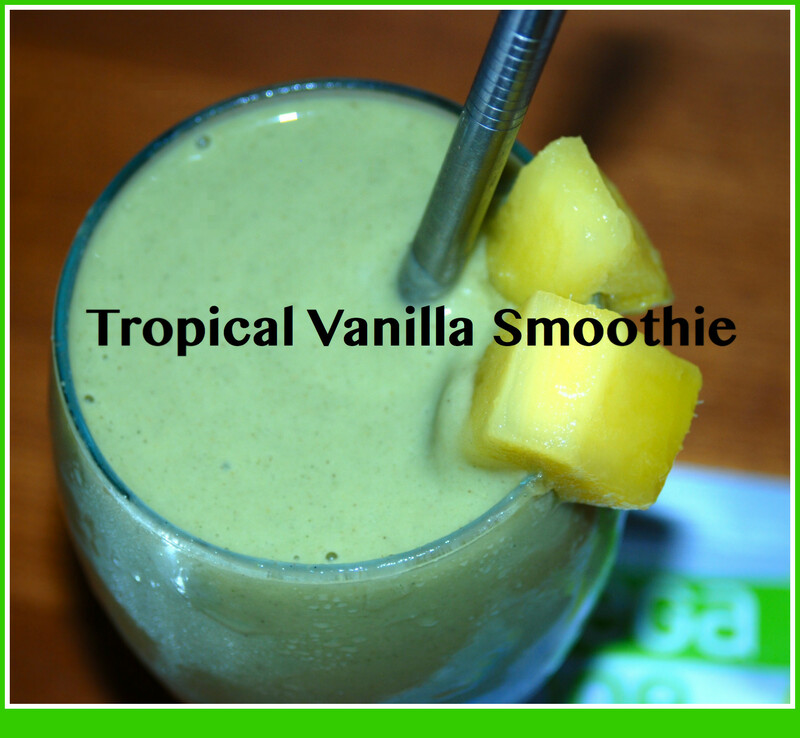 If you missed the last two posts in my smoothie series, you can catch up here & here. I’ve been busy (as usual) talking about, blogging about, and drinking green smoothies. I have also fallen in love with a “non-green” smoothie. What do these two smoothies have in common? VEGA ONE. This kit came with 5 packets of ready to mix or blend powder in three different flavors, a few recipes to get you started, and a coupon for a large tub of powder. I really like the idea of getting to try something for 5 days to see if you like it. It would be a drag to buy an entire container of protein powder, only to realize that one scoop in, you detest the flavor, or find out that your stomach just doesn’t jive. Also, I love the idea of using the “starter kit” as a way to motivate yourself to start your day right for 5 days… just to see what happens… No big risk taken. Hey, if you really hate it, you could always go back to eating cold toast during your commute right?! I have to say that I am a tough critic for several reasons- I am picky, I have food allergies, and I demand that my food be nutritious & convenient…. Oh & it has to taste good, because if not, what is the point? The Vega One Starter Kit met all of my needs. 1.8 cups of GREENS (broccoli, kale, alfalfa, spinach, chlorella)!!!! I really like the fact that Vega One can “greenify” a smoothie because sometimes you just don’t have fresh produce on hand but still want to eat well. Also, I think for someone just starting out, this makes things very convenient. What’s better than eating chocolate for breakfast? Dark chocolate & VEGA covered berries of course! 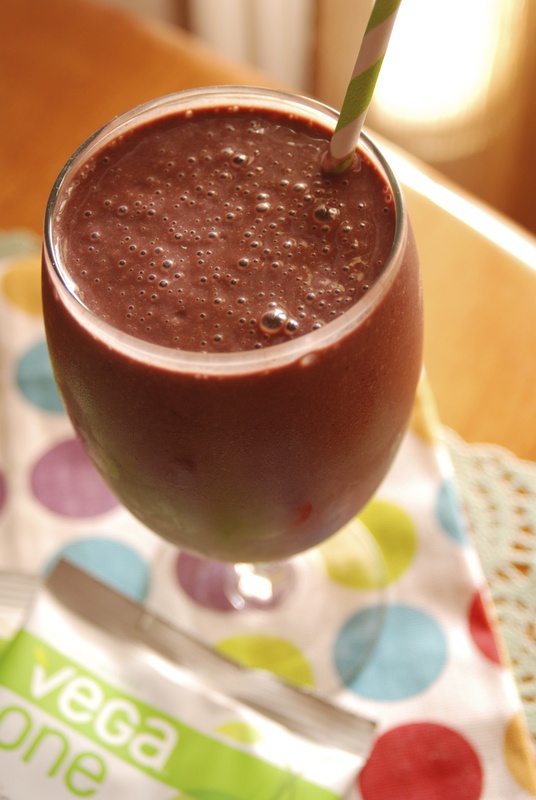 Great for an on-the-go breakfast or late afternoon snack, this shake is quick, yummy, and nutritious! 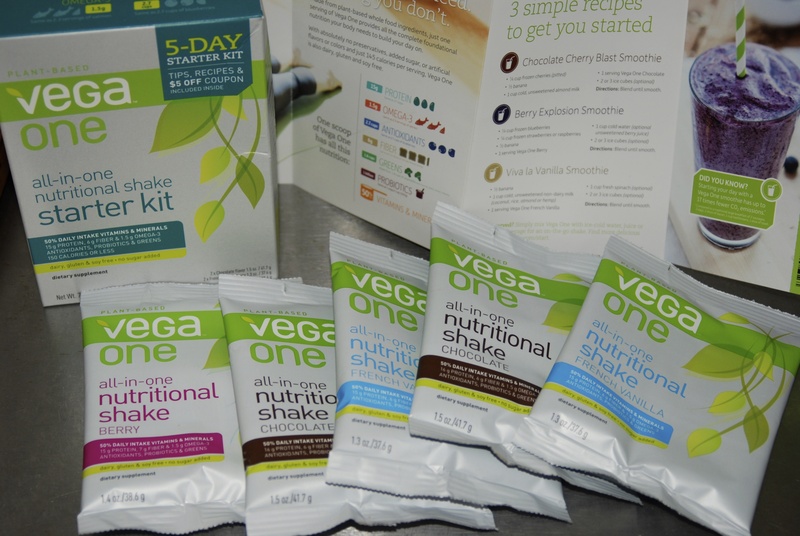 In a nutshell, I really like the idea of the Vega One Starter Kit and I am impressed by all of the nutrition they packed into one shake serving. Have you ever tried any Vega products? Disclaimer: This post is a #VegaOneStart product review but all opinions are my own. Love the recipe! Thanks for the vega review – I have seen them in the store, but have been too intimidated to try. I will look for these starter packs now! Hi Hali! It’s funny, after we last talked I was wondering if the shakes you told me about were from Vega. Of course I couldn’t remember! But I’ve been trying these for the past month or two! I bought them at the co-op to try out. I wanted to compare them to the Isogenix shakes we’d been having, because Vega seemed more ‘natural’. The flavor took a little getting used to, but yesterday I made a berry one with coconut milk, a banana, some ice and frozen strawberries and blueberries. It was SOOOOO good! I’m not a lover of green smoothes, so these really help me to get my greens. So glad to hear you are trying them too! I hope you’re feeling better and will call soon to catch up. That looks like a delicious chocolate shake!! Vega might be a good option for me, because it’s plant based. I’m still not sure how I feel about protein powders as a whole.